Hi there! How’s your week going? 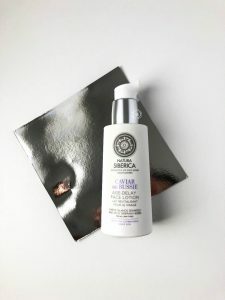 Today I’m sharing with you a new review, in this case for the Caviar de Russie Age-Delay Face Lotion by Natura Siberica. This should be a gentle cleanser for the first step of your double cleansing. Do you want to know more about it? Let’s go! You can get the Natura Siberica Caviar de Russie Age-Delay Face Lotion on Amazon. Natura Siberica is a Russian skincare brand founded in 2008. Its basic aim is to provide skincare products with a natural origin, elaborated from wild plants and herbs from Siberia. The original idea was to share the natural remedies that had been used in the most isolated villages of this remote region, but nowadays they have evolved to share remedies from other regions, such as Saaremaa or the Feroe Islands. I discovered this product in one of the brand’s products in Barcelona. I stumbled upon the shop by chance and, after reading great opinions about the brand, I decided to have a look. It was really nice to get a better knowledge of the brand’s range (which is quite big) and decided to take this face lotion and give it a chance. This is a very lightweight face lotion with a floral scent and that is so easily applied. However, when using it, I feel that it didn’t give me a proper cleanse. I actually tested it by applying eyeliner on my cheek and it didn’t take it off, which was a bit disappointing. I like using gentle products for my first cleanse, but it should be effective. I do have to recognize that, after using it, my skin gets very soft and hydrated, so even though it’s not a strong cleanser, it leaves a really nice feeling. Among the ingredients of this Caviar de Russie Age-Delay Face Lotion we can find caviar extract, with antiaging and repairing properties, arctic berry, rich in vitamins and antioxidants, and alaria esculenta, with antioxidant and hydrating properties. The packaging of this product is very nice and elegant. The box is white, with grey and purple details. The tube is white too, with a pump and details in grey and purple too. It’s really easy to apply the right amount of product, with just one pump you get as much product as you need. I have been looking for a proper first cleanser for quite some time, and that journey hasn’t been easy. This face lotion isn’t the perfect product. I think it’s too gentle, even though I really enjoy how hydrating it feels to use it. I don’t think I’ll purchase it again, since it didn’t work as expected, but maybe it’s what you’re actually looking for. This face lotion should be the first part of your double cleanse (which I told you about in this post). To use it you should apply some luke warm water first, take a pump and properly extend it, gently massaging your skin with your fingertips. After that, you should take it off with water and normally continue with the rest of your routine: second cleanser, toner, serum, boosters and moisturizer. Have you tried this product? Did you know Natura Siberica? Is there any other product from the brand that you would like me to try? If you have any questions feel free to leave a comment and I will reply as soon as possible. How to properly use cosmetics products.